Webmasters always stay in touch to monitor their blogs/websites through many analytical tools, the smooth ways to do so, is through Google Adsense. You must have searched these terms on Google for once like how to increase AdSense earnings per click or how to increase Adsense clicks, so today I’m going to share the best tips with which you can increase your Google Adsense earnings instantly. Many people are working hard by day & night to increase Adsense clicks and to achieve this goal to have some earning from their blogs or websites. Many people are going through the Google Adsense and getting a rich amount from Google Adsense from their blogs/websites. These webmasters are thinking different from others and enjoying a lot of money through their blogs/websites on the Internet. You should also check this lead magnet method to boost your leads or earnings. Webmasters have a sharp eye and know how they have to work on the Internet and how they can earn from Google Adsense and their thoughts are out of the box. The webmasters who have been there and working on it have some functional tips to assist those who would want to undertake into this field. Such kind of these tips has become the reason of good earning source in the past and also goes on. There are some five authentic ways with which you can enhance your Google Adsense earnings. I’m not saying you can get double Adsense earnings instantly but yes you can increase your Google Adsense earnings for sure. So let’s directly come to the point how to make more money with Adsense? Step 1- 1st you have to focus on your Googles Adsense advertisement format. The format which is being used on large scale is “Large Rectangle”. The Large Rectangle is 336X280 in shape. The format of Large Rectangle, have the leaning to result as per the best CTR, or the click-through rates. The reason behind “Why people are using this format whereas there are many formats available in Google Adsense accounts? The cause is that the ads are shown like web links according to the web page, and visitors, being used to clicking on such kinds of links. They may or may not have the knowledge they are clicking on your Google Adsense’s Ads but they use to click on ads, then actually it becomes the part of your major advantage of earning money. Step 2- 2nd you should have to make a custom palette for your Google Adsense. You should carefully select the color scheme for Google Adsense ads same as your blog/website looks like. By using an appropriate color scheme of Google Adsense ads, ads will mix with your website's links and look the part of your own website material. Most people try to use white of your ad border and background. Finally, it will become the way of a good result to have more clicks from people by visiting your blog/website. Step 3- 3rd you should have to place Google Adsense ads neither on the bottom of your blog/website nor at the inappropriate place of your blog/website. The Google Adsense ads should be placed on the top of your blog/website. You should try to place your Google Adsense there where internet users/visitors shall able to see them easily. Step 4- You also have to keep the links according to the relevant websites. If you think about that the some of the websites are better off than the others one, put your Google Adsense ads there and keep trying to monitoring and updated them. If you already have placed lots of Google Adsense then put into that definite website, put yours Google Adsense ads on top of all other advertisements. Using this way visitor will be able to see your Google Adsense advertisements first as he browses your blogs/websites. Step 5- Always keep trying to make routine about the placing of your Google Adsense Ads code into the blogs/web pages by using SSI (server side included). First, you have to know about it from your web administrator. You can ask your web admin about the supporting of SSI, whether your server supports SSI or otherwise. You have to just save the code of your Google Adsense in your computer in a text file, label it as “Google Adsense text”, and just upload it to the main/root directory of the web server. Then, call the code on all other pages using SSI. No doubt, this way will save your time as well especially for those people who use the automatic page generators to build pages on their blog/website. Here are some of the tips that have performed well for a few who want to make hundreds and even thousands on their blogs/websites. It is pretty much important to know that Google Adsense ads are shown because it is according to the interest of the people visiting them. However, targeting on a specific article/topic should be your primary/main purpose because the display will be specially targeted on an article/topic that already been viewing. You should also have to note that there are too many other Google Adsense sharing the same topic as you are. It is best to think of making a good Google Adsense ad that will be fairly different and unique than the ones already created as well as upload. 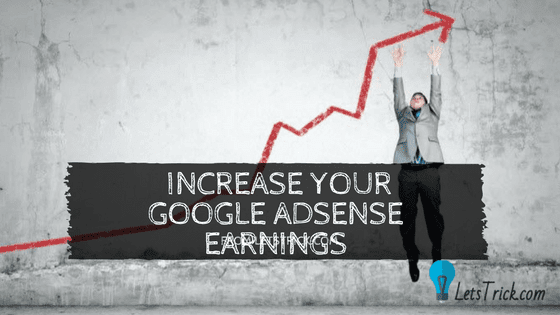 Hope these tips will help you to increase your Google Adsense earnings as soon as possible. Lot’s of my friends have seen a sudden increase in Adsense earnings with these tips and I’m sure you’ll also feel that success soon. Otherwise, you can also increase your earnings with mobile AdSense revenue. At last, if you think this can help someone searching for how increase Adsense income then please don’t forget to help him/her by sharing this post. Great post, I guess most of the people who are adsense users will probably want to maximize their earning. So these tips will surely help them to achieve.